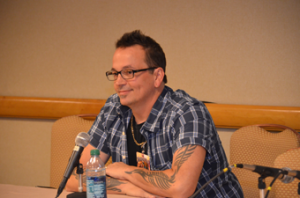 at DragonCon 2012 and to the delight of many in the audience he spilled the beans on the upcoming new Teenage Mutant Ninja Turtles Series that will debut on September 29th at 11:00am on Nickelodeon with a special 1 hour episode. The panel attendees got to see the new opening theme song and a couple of scenes from the new Turtles series. Eastman pointed out that a lot of people who loved the Teenage Mutant Ninja Turtles as kids, now actually have kids that are “turtle age”. Despite being a cartoon about ninja turtles, the original comic series was dark and meant for adults. Of course as the franchise grew up in the late 80’s it was evident to Eastman and co-creator Peter Laird that the Turtles morphed into a kids and now what we would call tween epidemic. The new Turtles comic books will be geared toward grown folks but the cartoons will try and fit a happy medium for all to enjoy. Eastman had sold his rights to the franchise to Laird in a process that started in June of 2000 and concluded in 2009 however Eastman was hired on to consult the new third animated series of Teenage Mutant Ninja Turtles. Eastman joked that in the animation studio the new animators referred to Eastman as Obi-Wan and that there were animators working on the new Turtles that grew up with the originals. The new series will feature Jason Biggs as the voice of Leonardo, Rob Paulsen as the voice of Donatello, Sean Astin as the voice of Raphael and Greg Cipes as the voice of Michaelangelo. April O’Neal is of course coming back for this series as well and will be voiced by Mae Whitman. Eastman also revealed that his first Turtles graphic novel in 25 years is due to the publisher by September 10th and if he hits his deadline it should be released sometime in October on the heels of the premiere of the newest series. One of the best reveals in the panel was that Eastman’s youngest son Shane became aware of the Teenage Mutant Ninja Turtles when he was three or four and started playing with some of the toys his older brother Peter had. Shane was so excited about the Turtles and didn’t understand that his daddy drew the Teenage Mutant Ninja Turtles. Eastman had remarked that for two decades people had told him that their kids grew up with the Turtles and he never got to see that first hand until his son fell in love with them. Shane went on to be Raphael for three consecutive halloweens. How cool is that. Check out our exclusive video below where Eastman talks about how he is really excited about this new series with the Turtles that he and Laird started nearly 30 years ago. 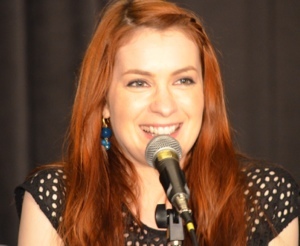 During The Guild full cast panel at DragonCon 2012 today Felicia Day announced that they just finished up season six of the hit web series two days ago. The entire cast was on hand for the Q&A which met more to the casts experiences and quirky experiences more so than leaks and spoilers for the upcoming season. One of the only spoilers was that Jeff Lewis’ baby son makes a cameo appearance this season and Lewis has another baby in the oven. Day announced that this years season will be available on the Geek & Sundry YouTube channel which plays host to Wil Wheaton’s Tabletop and Day’s own vlog called Flog. One of the most fun audience questions in the panel is what character would each actor be if they did a body swap show. Day, the shows creator and producer, seemed to like that idea as well. we could see her wheels turning. Sandeep Parikh was the comedic highlight of the panel. He kicked off the fun and games by trying to answer an audience members phone. He also answered questions about his tv mom and whether or not that was his real mom. Had we gotten a chance to ask Parikh a question we would have no doubt complimented him on his work in Office Space and the Harold & Kumar flicks. The complete cast is on hand for various panels and autograph sessions on the infamous walk of fame all weekend long. Day said that DragonCon was one of her favorite shows. This year many Day fans were disappointed when she didn’t make an appearance at SXSW. DragonCon and SXSW are typically staples in her hectic con and appearance schedule. Day also said that this was only the second time in five seasons that the entire cast was able to be on a panel together. 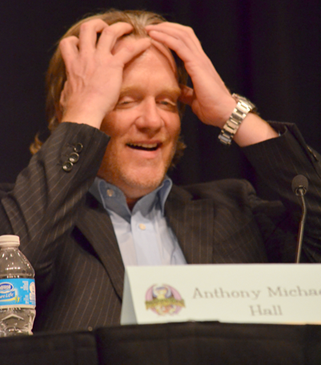 Childstar turned sci-fi favorite Anthony Michael Hall was the featured panelist at DragonCon 2012 today in a panel called “An Hour With Anthony Michael Hall”. The flagship ballrooms at the Hyatt Regency in downtown Atlanta were filled wall to wall with people of all ages. Many middle-aged folks loved growing up with Anthony Michael Hall in the John Hughes films that made him famous like Sixteen Candles and Breakfast Club. The question and answer panel was a prequel to the upcoming panel that will feature the case of Warehouse 13, Hall included. Hall played a wheel chair bound villain in four episodes of the SciFi channel hit show. During the Q&A Hall fielded a variety of questions that encompassed his entire professional career. The facilitator jokingly mentioned Pretty In Pink but had found out earlier in the day that wasn’t a Hall flick. He was of course asked about the transition in his career from teen star to career actor, which he lightheartedly responded he had 25 years to work on it. Hall avoided the type casting plague after the first three Hughes’ films and even went on to hold the leading role in USA Network’s Dead Zone. He also directed an episode of Dead Zone which inspired him to start a company called Manhattan Pictures where he will serve as the filmmaker. He has a film coming up called “The Lost Shield” which he will hopefully begin shooting in New Orleans shortly. He’s been developing the idea for the last four years and has investors on board and ready to go. He’ll also be headed to Salt Lake City in the coming weeks to start filming a movie called “Friend Request”. Obviously it has something to do with Facebook. Hall plays a single dad who’s also a cop, and has to find a killer that’s using the fictional social network “MyBook” for his targets. One of the best questions during the Q&A wasn’t about any of that work though. It was about portraying Microsoft CEO Bill Gates in the iconic film Pirates of Silicon Valley. Most of our readers are well aware of the film and have seen it multiple times (as have I), however most critics talk about Noah Wylie’s portrayal of Steve Jobs rather than Hall’s role as Bill Gates. In our previous geekery, techie and mobile lives two of our favorite events to cover have been ComiCon and DragonCon. Let’s face it most startup founders, developers,designers, entrepreneurs and coders are really geeks at heart. If you haven’t been to DragonCon before it’s the ComiCon of the east coast and despite it’s size it still has that alluring feel of a convention that hasn’t sold out to big business. If you’ve been to ComiCon in the last five years or so you’ll notice a huge amount of commercialism. The grass roots comic book and pop culture convention feel has drifted away. That’s not the case for the four day event held in Atlanta every year. 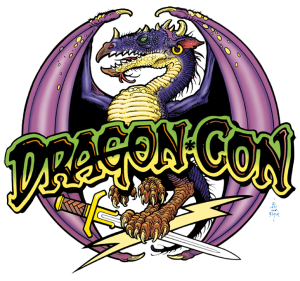 We’ve got an entire team that will be blogging, posting photos and broadcasting live on AOL and Slacker radio all weekend long to bring you all the delicious DragonCon action. We’re going to hit the best panels on the culture side and also some of the tracks that will undoubtedly provide great content and information for those of us building businesses. DragonCon covers so many different parts of current culture it’s hard to believe they do it in just one weekend. 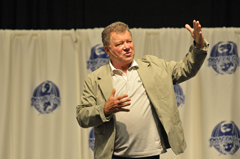 Attendees will be able to mingle with celebrities from their favorite sci-fi programs, web programs, and even comic book heroes. There are tracks and panels on writing, art, comics, pop culture, gaming, sci fi, and even the Skeptics track which I personally love. Heck last year there was a panel on WKRP in Cincinnati which Howard Hessman and Lonnie Anderson where there as the speakers. This upcoming weekend will feature a decent break from our day to day startup coverage but we’re all going to go back to our roots as geeks, comic book readers, sci-fi lovers, Dr. Who fans, gamers and much much more. There’s a huge commonality between the DragonCon/ComiCon go-er and those of us in the startup world. Sure we were a little off as kids and teenagers but now we’re building products, software, and businesses. For those of you familiar with our coverage of DragonCon and similar events on our other sites, this year we’ve got StoryMark an Atlanta startup on board as the the photo sponsor. That’s only fitting because DragonCon is in Atlana however we’re going to use their unique app to post a ton of photos in our social media channels and here at nibletz.com with audio clips. As the days get later and later though, please be aware that they serve alcohol by the bucket at this event. StoryMark is a great photo app partner their app allows you to record a :30 second audio excerpt that gets embedded in the finished photo product. So now you don’t have to write out a long azz caption when you’re not sure what’s in the photo. It’s also perfect for families and loved ones to send great photos back and forth. We like to kid with the founders of StoryMark and just point out that every photo sponsor we’ve had at DragonCon,ComiCon, NYCon and CES has gone on to get acquired (Instagram), AcquiHired (LightBox) or a huge investment (CoolIris).